"Brownie Biscotti with Walnuts". No collection of Chocolate Biscotti wouldn be complete without these. This delectable combination of chocolate and walnuts recipe, will remind you of the brownies your mom use to make. They have nice crunchy texture and chocolaty flavor. The addition of a white chocolate dip is reminiscent of frosted brownies . Even though brownies are the most popular type of bar cookies "bar none"; no pun intended. These Biscotti will become a favorite of your family. They are sure to satisfy anybodies craving for chocolate and nuts. The rich chocolate flavor with pare well with a glass of milk or a hot cappuccino. So make them soon! In a bowl sift or wisk together flour, sugar, cocoa, baking powder, baking soda and salt. In another large bowl beat butter, eggs and vanilla. After well beaten gradually mix in, by hand the flour mixture. Add the nuts and mix until incorporated. After mixing, scrape the dough out onto a lightly floured work surface and BRIEFLY knead it just until it comes together and the divide it in half. 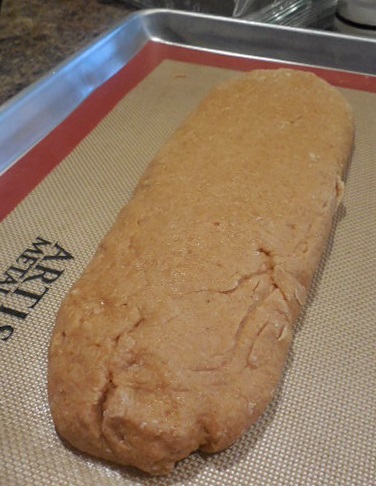 Shape each half into 12 x 3 inch logs and carefully transfer to prepared baking sheet. Place the baking sheet on the center rack of your oven and bake for about 30 minutes, or until the logs are firm to the touch. Place the baking sheet on a wire rack and allow the logs to cool for 10-15 minutes. Using a serrated knife, cut the logs on a slight diagonal into 1/2-inch thick slices. Place back on cookie sheets, return to oven and bake for an additional 20 minutes until they are crisp. Remove from baking sheet and place on a wire rack and allow cool completely. When ready to serve gently melt white chocolate and drizzle over the biscotti and allow to chocolate to harden. Store cookies in one layer in air tight container.